Richard Rorty is famous, maybe even infamous, for his philosophical nonchalance. His groundbreaking work not only rejects all theories of truth but also dismisses modern epistemology and its preoccupation with knowledge and representation. At the same time, the celebrated pragmatist believed there could be no universally valid answers to moral questions, which led him to a complex view of religion rarely expressed in his writings. In this posthumous publication, Rorty, a strict secularist, finds in the pragmatic thought of John Dewey, John Stuart Mill, William James, and George Santayana, among others, a political imagination shared by religious traditions. His intent is not to promote belief over nonbelief or to blur the distinction between religious and public domains. Rorty seeks only to locate patterns of similarity and difference so an ethics of decency and a politics of solidarity can rise. He particularly responds to Pope Benedict XVI and his campaign against the relativist vision. 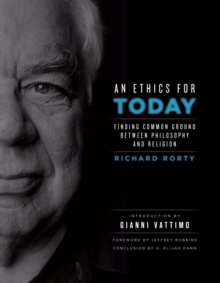 Whether holding theologians, metaphysicians, or political ideologues to account, Rorty remains steadfast in his opposition to absolute uniformity and its exploitation of political strength.